In a calm and serene world, one has the luxury of imagining what the future might look like. Now try to imagine that future when your way of life has been devastated by forces beyond your control. 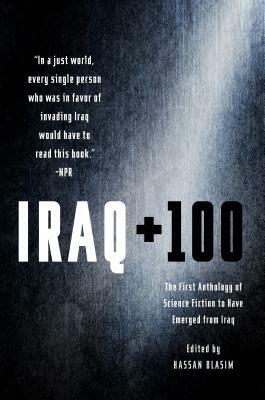 Iraq + 100 poses a question to Iraqi writers (those who still live in that nation, and those who have joined the worldwide diaspora): What might your home country look like in the year 2103, a century after a disastrous foreign invasion? Using science fiction, allegory, and magical realism to challenge the perception of what it means to be “The Other”, this groundbreaking anthology edited by Hassan Blasim contains stories that are heartbreakingly surreal, and yet utterly recognizable to the human experience. Though born out of exhaustion, fear, and despair, these stories are also fueled by themes of love, family, and endurance, and woven through with a delicate thread of hope for the future. Described by The Guardian as “perhaps the greatest writer of Arabic fiction alive," Hassan Blasim is an Iraq-born film director and writer. A multiple PEN Award winner, he is the author of The Corpse Exhibition, which won a number of awards, and The Iraqi Christ, which won the Independent Foreign Fiction Prize in 2014, making Blasim the first Arabic writer to win that award. He lives in Finland.